Above photo: Colleen Flanagan of Boston, center, and others in wheelchairs with a group called ADAPT, rally prior to a hearing by the Senate Finance Committee on the Graham-Cassidy health care repeal, on Capitol Hill in Washington, Monday, Sept. 25, 2017. J. Scott Applewhite. Washington, DC – With the September 30 deadline for the budget reconciliation process looming, Senate Republicans attempted once again to repeal and replace the Affordable Care Act (ACA). Senators Lindsay Graham of South Carolina and Dr. Bill Cassidy of Louisiana submitted legislation last week that would end the Medicaid expansion, cut federal funds for Medicaid and allow states to decide that insurers could deny coverage for pre-existing conditions. States would also no longer have to require that insurers cover essential benefits, as defined in the ACA. The bill seemed dead by the end of last week when Senator John McCain announced that he would vote against it. But Senators Graham and Cassidy went into high gear over the weekend to add extra funding for states like Alaska, Maine and Arizona to encourage their support. Activists throughout the country also geared up to fight back. 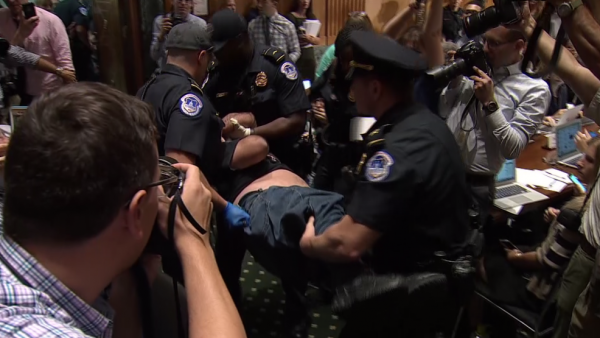 By early Monday morning, hundreds of people, including many disability rights activists filled the halls outside the Senate Finance Committee room to protest a hearing on the bill scheduled by Graham and Cassidy. Reporter Jeff Stein took video of the line at 7 am. The hearing was scheduled for 2 pm. If health care defenders had their way, that hearing would not even take place. As the line grew, police formed a human chain around the attendees. And as the hearing started, the few who were admitted began to disrupt. Maine Senator Susan Collins announced her opposition to the bill, joining Senators John McCain and Rand Paul of Wisconsin. Protests against the bill took place elsewhere around the country. 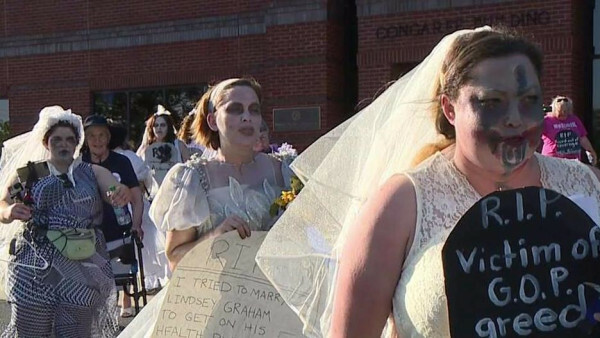 In Columbia, South Carolina, dozens of ‘zombie brides’ visited Senator Graham’s office to oppose the bill. And protesters rallied this morning in Ohio to send Senator Rob Portman a message to oppose the bill. All in all, it is clear that people in the United States will not tolerate changes that drive millions of more people off of health insurance. And with support for National Improved Medicare for All growing, it is time to turn that energy towards making a universal publicly-financed high quality and comprehensive healthcare system a reality in our nation. Join our campaign at HealthOverProfit.org.